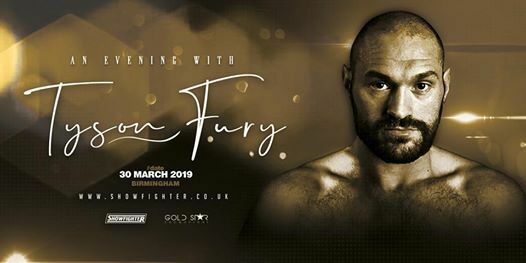 Tyson Fury is making an appearance for an audience with his fans in Birmingham on the 30th March 2019. After being out of the ring for 2 and a half years the Gypsy King made his phenomenal comeback defeating Seferi and Pianeta before confronting Deontay Wilder on November 2018 with 12 rounds of an intense onslaught from both sides. The match was declared a draw but we all know who the true winner is! The former unified heavyweight champion of the world will share his personal story - live and unscripted on stage, with celebrity interviewer Michelle Joy Phelps. 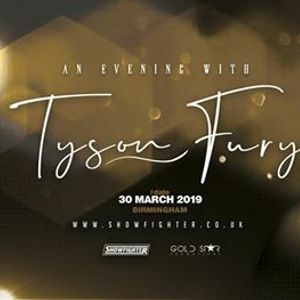 Tyson Fury will be answering questions from the audience and the evening will feature a mix of top entertainment, red carpet reception, stunning memorabilia auction and a delicious meal. Meet the self-proclaimed Gypsy King in person and enjoy a fabulous night of entertainment – do not miss out! Limited VIP Meet and Greet and VIP Photo ticket upgrades available.